Greenline 33 is the best choice for a couple with occasional friends or a small family of experienced yachtsmen, for hardened sailors or even for newcomers to boating. This small yacht of impeccable quality puts your well-being onboard first while respecting the sea and our best boating traditions. The design of the Greenline 33 completely redefines user-friendliness, changing the way you will spend your leisure time at sea. A flexible interior, excellent visibility, high levels of ambient light and room to move around in comfort – all features that have never been offered on a 10 metre boat before. With big glass surfaces in the salon and the owner’s cabin, the Greenline interior is always full of natural light, offering great visibility and a feeling of connection to the outer world. 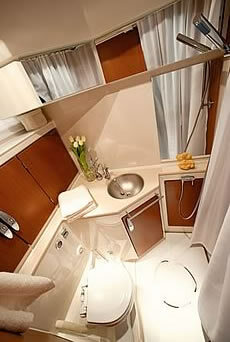 Another benefit is found in the owner’s cabin, where the beds can be moved to create single or double berths. The mattresses are standard sized, greatly enhancing sleeping comfort. As the large aft glass door in the lounge area can be fully opened, the Greenline 33 gives you a unique feeling of being inside and outside at the same time. This feature allows you to turn the salon and cockpit into one large space in warm weather, either to increase your living area and create a truly al-fresco environment. 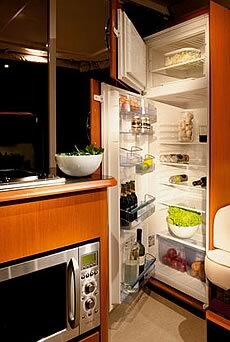 With a large refrigerator, deep freezer, microwave and classical oven, cooking and food preparation on board will become an enjoyable pastime, minimising the difference in comfort between your home and your boat. A remote-controlled, electrically opening and closing platform for easy water and dock access. Enlarging the lounge/cockpit area by 4 m2. Because the Greenline 33 uses a 230V AC internal power supply system, you can recreate the comfort of your own home with a range of home appliances like a refrigerator (there’s room for a 270 litre unit), a microwave oven, TVs and A/C. The extended cabin roof gives full protection from the sun, rain or wind. An optional canvas cover can be fitted to fully enclose the cockpit area and extend your boating season when the weather turns colder. Deep, covered sidewalks provide additional security while anchoring, mooring or going to the bow, ensuring that your guests are safe and comfortable. When you combine one of the best insulated engine bays with a modern Volkswagen diesel engine, you get one of the most silent boats on the market today. With nothing more than a whisper-like hum at cruising speed, both when using electric or diesel power, the Greenline 33 never disturbs your comfort while underway or when recharging the batteries. When in dock (shore power mode), the boat is plugged into the 230 V AC shore power supply. The battery array is under charge and the inverter provides up to 3 kW of AC power to run home appliances like the fridge, TVs, etc. In electric drive mode (e), the boat is powered by the eM/G, which can produce up to 7 kW of electric power. This mode is used to sail in and out of a marina or anchorage with no noise, no smoke and an insignificant wake at speeds of up to 6 knots. At 4 knots a fully charged battery array provides a range of up to 20 miles. In diesel drive mode (d), the diesel engine propels the boat and drives the generator, which recharges the battery array at an output of 5 kW. At anchor the solar roof array charges the batteries, which provide a 230 V AC power supply to the appliances (via a 3 kW inverter). If the level of battery charge drops below a set value, the diesel engine is switched on in order to drive the generator and charge the battery array via the 5 kW generator. The propeller is disengaged (the gearbox is in neutral). This is the anchor charge mode. Boarding and swimming access via a fold-out stern platform. Large sun and rain protected cockpit with storage under. Sun bathing area on the front coachroof. Uncluttered bow area for easy anchoring and rope handling. Salon with a 360 degree vista. Salon fully connected to cockpit to form one area (fully opening aft salon glass enclosure). Galley starboard aft – to be served also from the cockpi when enclosures open. To port a 270 l fridge with a deep freeze locker (optional). Two large sofas to port and starboard. Starboard sofa converts to a double bed, making it possible to sleep 3 persons. A table with 2 flaps. A two-position driver/passenger double seat (facing forward in drive position and facing back to increase the settee area at anchor or in port). Washroom / toilet to starboard. 2 home-sized spring-mattresses (80 × 200 cm). Displacement empty: 4800 kg appr.